10.) It's a cheap thrill. Only $6 for two tickets. 9.) You might win something cool. 8.) You'll earn good blogging karma for helping out some fellow bloggers. 7.) You're my friend and you know I'd enter your fundraising raffle if you had one. 6.) Did I mention it's cheap? $3 per ticket? That's less than a gallon of gas! That's less than a gallon of milk! Heck, in a month or two, I'm pretty sure that will be less than an apple. 5.) You want to support Powerful Blogger Ladies. 4.) This is only the second year that the Democratic National Convention has admitted bloggers as press. We at MOMocrats.com want to prove to the DNCC that bloggers play a vital role in the public discourse, and deserve seats in the press box. To that end we want to send as many MOMocrats bloggers, and cover as many convention events, as possible. But to do that, we'll need your help with travel and lodging expenses. 3.) We want to bring the convention experience straight to your monitor, with fresh, first-person accounts of events as they happen. Liveblogging. Interactive chats. Live podcasts. Video interviews. We want our readers to feel like they're right there with us in Denver. But to do that, we'll need your help to purchase some new equipment: wireless cards that will allow us to blog from anywhere. Video cameras. Voice recorders. Etc. 2.) Of the 124 blogs offered official credentials to cover the Democratic National Convention, MOMocrats is the only credentialed blog specifically focused on engaging more mothers in the political process. Sure, we'll be asking the politicians we meet there about issues that affect everyone, and are big in the news, like the environment and the economy (see #6). But we'll also be asking the politicians we meet there about education. We will be asking about child product safety. We will be asking them about child safety on the internet. We will be asking them about family leave, and discrimination against mothers in the workplace, and health care for children with special needs. Will CNN be asking all of those questions? Will NBC? Will Fox? 1.) If you help get us to Denver (or event if you don't), we'll help take your specific questions and concerns to some of our government's top movers and shakers. If there's something you've been wanting to ask Claire McCaskill, or Nancy Pelosi, or Howard Dean, send us an email or drop us a comment. We'll pay attention. 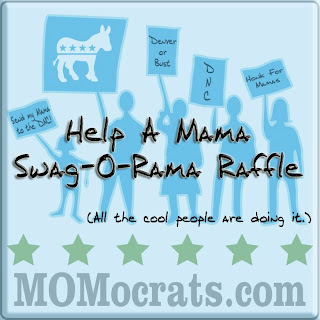 Visit the MOMocrats.com Help a Mama Swag-o-Rama if you'd like to purchase a raffle ticket.